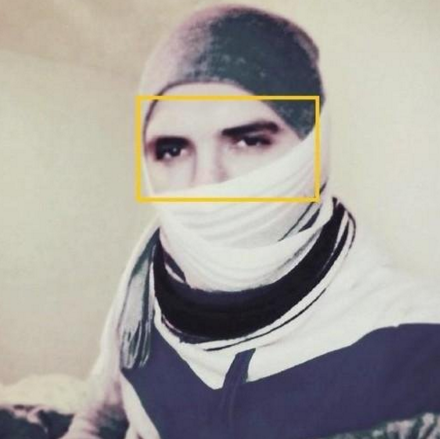 “Skafisti” is a Twitter personality who propagates ISIS’s ideology by disseminating its publications and tweeting in support of the terror group.Skafisti, Twitter, accessed December 5, 2015, https://twitter.com/Skx81. 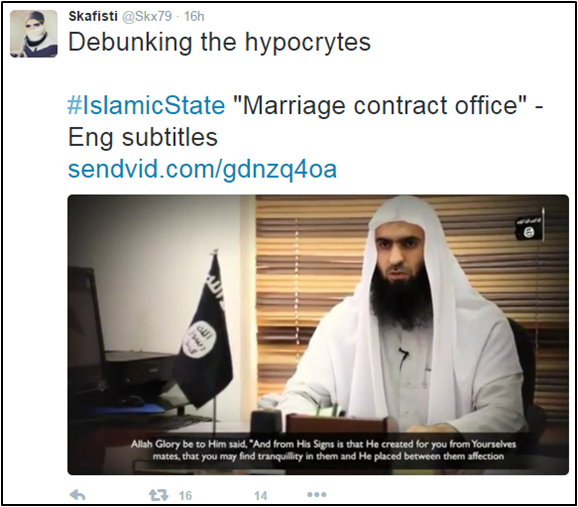 On December 2, 2015, he shared an ISIS propaganda video touting “marriage contracts” in the so-called Islamic State. The video—hosted by the video uploading service “Sendvid”—is tailored for a Western audience, complete with English subtitles.Skafisti, Twitter post, December 2, 2015, 10:50 p.m. 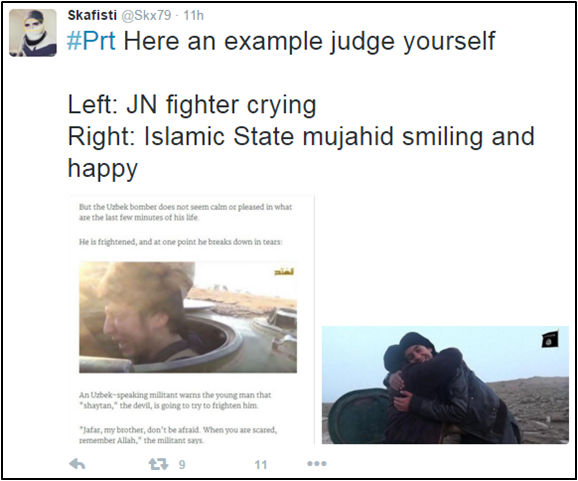 In early December 2015, Skafisti disparaged ISIS’s rival group, the Nusra Front (Jhabat al-Nusra, or JN), by tweeting a photo of a “crying” JN soldier next to that of a “smiling” ISIS soldier.Skafisti Twitter, Archive.is, accessed December 7, 2015, https://archive.is/gdQc6. Skafisti often refers to “Kuffs,” or kuffar (nonbelievers). On December 5, 2015, he tweeted: “there are no tanks in the earth or jets in the heavens that can protect [the kuffar] from Allah’s punishment.”Skafisti, Twitter post, December 5, 2015, 1:08 p.m. He has called on his followers to “read and spread” ISIS propaganda.Skafisti, Twitter post, December 3, 2015, 8:34 p.m.
Skafisti is repeatedly suspended by Twitter, but quickly resurfaces under a new user handle. CEP has been following him since early December, 2015. @Skx79Skafisti, Twitter, accessed December 2, 2015, https://twitter.com/Skx79. @Skx81Skafisti, Twitter, accessed December 5, 2015, https://twitter.com/Skx81. @skxx37Skafisti, Twitter, accessed June 24, 2015, https://twitter.com/skxx37. @Skxx80Skafisti, Twitter, accessed December 7, 2015, https://twitter.com/Skxx80. “May Allah deal with these descipable liars...tomorrow in shaa Allah i will upload a video in Eng about IS marriages” (Tweet)Skafisti, Twitter post, December 2, 2015, 9:54 p.m.
“IS [ISIS] never compromise when its [sic] about Islam no matter what, they have full tawakkul [trust] in Allah & He is their Maulana [leader]” (Tweet)Skafisti, Twitter post, December 3, 2015, 4:49 a.m.
“Tomorrow in shaa Allah [God willing] i will upload a video in Eng about IS [ISIS] marriages” (Tweet)Skafisti, Twitter post, December 2, 2015, 9:54 p.m.
“Kuffs cannot escape with their crimes,& there are no tanks in the earth or jets in the heavens that can protect them from Allah’s punishment” (Tweet)Skafisti, Twitter post, December 5, 2015, 1:08 p.m.
“Skaykh Adnani: No justice without Jihad, no honour without Jihad, no security without Jihad, no hope without Jihad, no life without Jihad.” (Tweet)Skafisti, Twitter post, December 5, 2015, time stamp unavailable.